On top of everything else that's going on, it's not surprising if you find it hard to squeeze in time to clean the loo as often as you'd like… We're all busy so anything that helps keep our homes clean is a blessing, right? 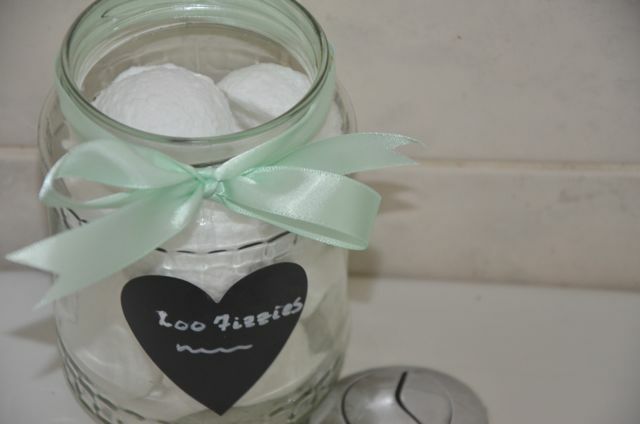 These little Loo Fizzies are just the thing. They take only a few minutes to make and help keeping the toilet sparkly clean a breeze! They're also a great housewarming gift, though I'm not above giving them to friends for other occasions too. To use them, simply pop one in the loo and let it fizzle away. It will not only leave the loo smelling lovely and fresh, but if you do have the time for a quick toilet brush swipe, it will make cleaning a loo that's overdue for a scrub a snap without the powerful fumes of store-bought cleaning supplies! I like to leave them on the back of the toilet for anyone to use if and when necessary and if they're left in an open jar, they will help to scent the bathroom as well. For me, these little helpers are essential during the holiday season or any other time when I seem to have a lot of traffic in and out of my flat - if you never know when someone might stop by, having these handy means your loo is one less thing to stress about when unexpected visitors come to call. When it comes to scenting these little guys, I'd encourage you to get creative. I love lavender, eucalyptus and peppermint, but a citrus or rose scent would also be nice. It's really down to personal preference. 1. 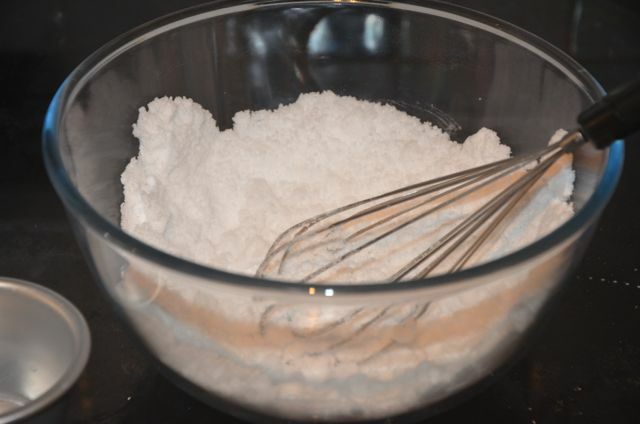 Add the baking soda to a large mixing bowl and stir with a wire whisk to smooth out any lumps. Add the citric acid and stir with the whisk to combine. 2. In a small cup or bowl, mix together the vinegar and hydrogen peroxide. Add this liquid mixture drop by drop to the dry mixture, whisking as you go. You want to whisk quite quickly to try to prevent as much bubbling as possible. 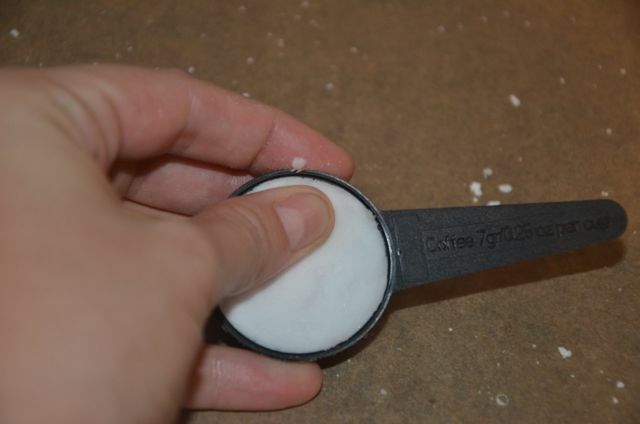 Continue doing this until all of the liquid has been mixed in and the consistency is like that of wet sand. 3. Add 20 drops of your chosen essential oil to the mixture and mix well with the whisk. 5. Using a measuring spoon or a small scoop (I like to use the little scoop that comes with coffee makers as seen in the photo), pack the mixture into the scoop. Use your judgement in terms of how much - I tend to pack my scoop between halfway and just short of reaching the top. Be sure to pack it tightly. If your fizzies are a little bigger or smaller, it's no bother. In fact, you could make these smaller, using a rounded teaspoon measurement - it's really up to you. 5. Tap the spoon against the tray to dislodge the Loo Fizzie. I find it works really well to do one swift, slightly forceful tap. 6. Lightly spritz the Loo Fizzies from a distance with 1part vinegar & 1 part water mixed together in a spray bottle to form a bit of a crust on the outside which helps them stay together. You just want a really like mist to fall over them - too much water and they will start to fizz like crazy. 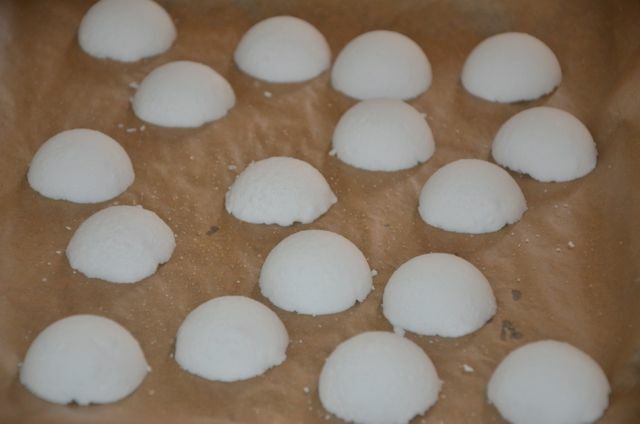 Allow the fizzies to dry on the cookie sheet for 1 to 2 hours before packaging. 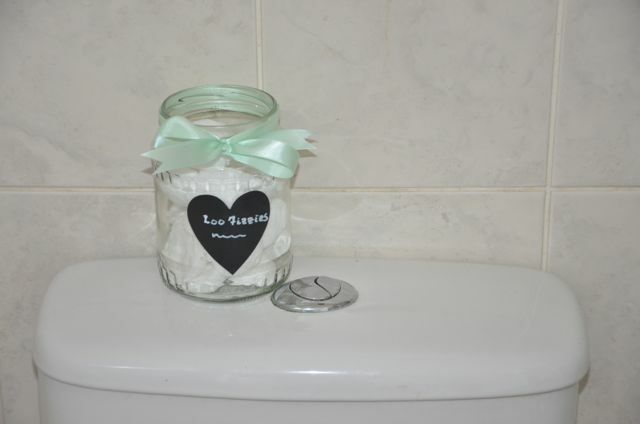 Display the Loo Fizzies in the bathroom or hide them away - the choice is yours. I like to keep mine in a jar with a ribbon and label on it. This was a store bought jar of pickles that had an ugly lid. I kept the jar, cleaned it up, tied a ribbon around it and labeled it with a chalkboard label and it works perfectly. Alternatively, Kilner or Mason jars work really well or simply package them in a treat bag to give to friends if you don't have any jars to hand. Ok, ok sold - these are just so sweet!